- Good evening everyone. Happy Transformation Tuesday. Welcome to another episode. We're up to episode five of season two. Thank you for joining me. 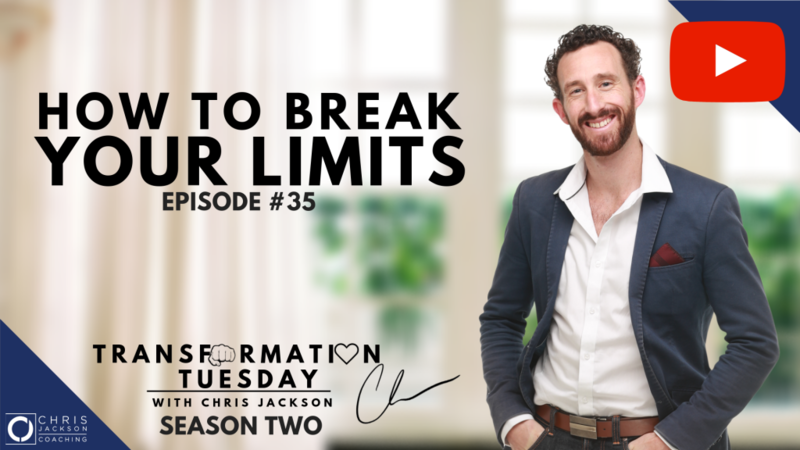 Tonight we're going to be covering how to break through your limitations. This is going to be a powerful episode. I'm going to be dropping some of the most powerful concepts that I have in the space of coaching, transformation, personal development and giving you some really really powerful nuggets of wisdom to really take away and apply. And most of, the most important thing I want you guys to take away from this episode is how to apply what you're learning. Hey Katrina, good to see you here. Hope you guys are having a great week. Let us know for those of you who watched last weeks episode, how did you go with the discovering your purpose exercise? How are you doing? Let me know how you're doing this week and tonight we're going to be covering some really powerful concepts around overcoming our limitations. We all have limitations. We all have things that are preventing us from living the most truest, most authentic, most empowered life. That's the truth of being a human being. There's no denying that. So what we're here today to unpack is a deeper level of awareness around how do we overcome our limitations? How do we break through them? How do we become aware of them? How do we take action and how do we integrate a new opening to overcome those limitations? So I'm going to be sharing with you some of the best hacks and tools of consciousness and transformation coaching that's going to help you guys overcome your limitations. Good to see you there Mike, Angela. Thanks for tuning in. So, as we go through guys I'd love for you to share if you can resonate with any of these limitations and I'd also love for you to share maybe perhaps what your biggest limitation in life is. So, and this, the degree to which you answer the question of what is my life's biggest challenge, what is my life's biggest limitation, it's a major clue the degree to which you answer that question, the level of awareness that you answer that question through will to a large extent determine how well you can actually overcome the objection, overcome that limitation. So I'll get into that as we go through. So, hey Angela. Good to have you back here. So, tonight I'm going to be covering a bit of a framework as to how to become aware of, how to take action, how to document, how to create a structure around this, how to take action, how to embody these changes because it's all in good to get the information but where the rubber hits the road and where the change actually happens is where we take action, where we implement, where we embody these changes. So it's really important that, I encourage every single one of you tonight, you should be taking notes. You should be, as you're taking notes you should be writing next to it in, and I recommend this is how you do everything for whenever you're learning. In one column in one colour say for example blue, you write down the information, the knowledge, the wisdom. In another colour in another column on the page, write down how are you going to implement this? How are you going to action it? And importantly, when are you going to action it? You need some accountability, you need some responsibility and if you have an accountability partner or a buddy who can go on this journey with you it makes it a hell of a lot more fun. So I encourage you guys to adopt that approach as you're going through this class. So first of all let's take a look at well what do I mean by limitations? What do I mean by how do we break through our limitations? Thanks Angela. Well, what I'm talking about is well, first of all we need to find well, what are our limitations? What do we mean by limitation? When I say limitation, if we have a limitation, well what does that mean that we're left with? Well, it means things like this. It means that if we had no limitations it means that we would be fearless. If we had no limitations we would be completely 100% self expressed in every single moment of the day. If we had no limitations, we'd be operating from a very connected, heart centred, empowered, intuitive space where we're just naturally making decisions, just naturally going about our day without our head getting in the way of creating trouble and without this thing over analysing. If we didn't have any limitations, we would just be naturally, unconsciously, intuitively making the highest quality of decisions and being truthful, being honest and being limitless in our expression. So, the key here is to recognise, yes we all have limitations. The key here is to get super specific on what is the limitation? And as I said limitations are things like if we feel like we can't be honest. That's a limitation. If we feel like we can't express our truth. That's a limitation. If we feel like we hesitate, or we're withholding information, or if we're procrastinating and there's a whole heap of these patterns I'm going to go into but ultimately if there's any hesitation, if there's any restriction, if there's any limitation whatsoever in our whole entire experience, where we're not completely aligned, connected and inspired for taking action, we know that there's some element of limitation. Now typically those elements of limitation, yes a lot of them are going to be unconscious. A lot of them are going to be outside of our awareness. So, the purpose of tonight's class is to bring to your awareness some of those limitations and once you become aware of them, you can now understand them and once you understand we can then create a structure and a process and action to overcome those limitations. So that's generally the process. It's awareness, understanding and then action to then embody the change. Now if you just get to awareness and don't understand it, don't take action well, congratulations, you've just indulged in intellectual entertainment. So, we don't want that. We want to go from awareness to understanding and then committing and taking responsibility for the change that we're looking to embody. So let me know if that makes sense to you guys because if before if you've been to trainings, if you've been to classes, if you've read a book and if you only get to awareness, well you're only 10% of the way there. I mean admittedly you have to get to awareness but you've got to get to then understanding and then taking action to embody everything that we're talking about. This is really important. So I trust that makes sense to you guys. So, let's talk a little bit more about limitlessness and why getting to a place of limitlessness is important because let's face it, if we have limitation we have restriction. We can't be the most magnificent and the most authentic version of us. Now when I say we should be the greatest version of ourselves, when I say greatness what I'm really talking about is I'm talking about authenticity. I'm talking about being our true self. Uninhibited, completely self expressed. Kind of like kids. Look at my little three and a half year old niece. She's 100% self expressed. She doesn't hold anything back. She doesn't have a filter. It's just complete, here you go. Have it. No filter whatsoever. So, at some point what happens as we're growing up, what happens is we now start to develop filters. We start to develop fears. Our ego starts to develop more and more and what happens is we now have limitation, we now have fears, we have limiting beliefs, we have all these filters that get in the way of us being truly intuitive, truly self expressed. So, it's worth knowing well, what are these programmes? What are these things that we accumulate as we go through our life? And how are they actually affecting us? 'Cause I think it's really important to know and understand how's it affecting us? So, and like let me know if you guys have recognised at some point, hey Doug Nerris. Nice to see you too. But let me know at some point in your life, if you've noticed that a limitation wasn't there but then one day it was there. So, these limitations, they get installed. They get created. At some point in our life, the fear, the limitation, it kicks in and all of a sudden, when we're a two or three year old kid maybe just dancing around the house with no clothes on, all of a sudden now we're self conscious. We're now worried about our perception. We're now worried about others judging us. We're worried about what others care about what people are saying about us. We care too much about what others think of us. So at some point, we've been conditioned and programmed, let's say conditioned and programmed by our external stimulus and the situations and the circumstances of our life to some point shut down that true self expression. So if we have shut down any element of our true self being fully self expressed, we know we have a limitation. Now that's okay. It's okay. There's nothing wrong with you. You're not broken. You don't need fixing. All it means is that there's a pattern of human behaviour. There's a little weed in the garden that's gotten in there that's started to grow and it's starting to take the garden. So now we're going through the process of pulling it out. So, let's look at some of the most common limitations. And hey Fiona, good to see you here. So, let's look at some of the most common limitations that most people face and I want to bring your awareness to how these happen and obviously we're going to get to the strategies on how to implement these. So, the first biggest limitation as being a human is we have an ego. Now I've spoken about this before. Now for those that haven't attended my class on the ego I recommend you go back to watch my class on the ego. There I go into a lot of detail around unpacking the needs of the ego, how it runs, but to give you a bit of a recap, the ego is a survival based programme. It's a survival based programme that has fear loaded on as the fault setting and what happens in we now, it's the programme that applies caution. It applies fear to absolutely everything, alright? So now this is a key skill to master. This is the ultimate skill to master in life is being aware of your ego, being aware of the programme of fear, and all the other little programmes of the ego that come along like things like judging other people, criticising others, blaming people, right? And as a result of the ego doing its job what happens is it keeps us safe, it keeps us bound, it keeps us limited. It creates the limitation and it creates limitation through the mind, alright? The ego lives in the mind. It doesn't live in the heart. So the ego lives in the mind. So when you're in your head, you know your ego is doing its job. So, there's some key distinctions here that I recommend if you haven't studied the ego, if you haven't checked out my classes before on the ego, go back and check them out 'cause you'll get a hell of a lot of value from understanding the programmes of the ego. So the ego is a major one. It creates fear. It creates resistance. Alright? Who here's got fears of not being enough or not being worthy? Who's got fears of other people judging them? Or caring way too much about what other people think? That's your ego doing its job. That's the fear based programme which is worried about what other people think of us which again is a pattern and I've talked about this before but I'll talk about it again 'cause this is so important to get this, it's a pattern of external validation of our worthiness. If we do anything in life, for the purpose of getting validation from someone else to give us a sense of approval or a feeling of I'm now good enough, then what we've just done is we've just outsourced our worthiness, we've outsourced our ability to love ourself to the emotional state, the opinion, the commentary of someone else. Now that's not a very empowering place to be. Now, I've been there and there is layers and layers and layers of this experience that are unfolding. And we need to understand that whenever we have a fear what's happening is our ego is doing its job. So, the limitations will be presented to us when we look at them. Now if you don't look at your limitations, then it's kind of like you're potentially driving your car down the freeway and you've actually got your handbrake on and you're not actually going as fast as you could be and you don't know why. Well it's the same thing in life. If you're not aware of your ego, if you're not aware of the fear, of the resistance, of the limitation, you can be living your life and there'll be a handbrake on and you won't even know where it is. So, this is the opportunity for us to take a really really deep dive into what those limitations are. Give me some other examples of limitations and tell me if these resonate. Hey Angela. Hope you're back with us soon. So, some other examples here of limitation. Limiting beliefs. Now, spoken about limiting beliefs before but these are critical. When you understand that all of your beliefs are made up, all of our beliefs are simply possibility filters and what we believe to be true, we can start to evaluate every single belief we've got through the lens of is it empowering me? Maybe that belief I've got is limiting me. I had a limiting belief for a large part of my life that I wasn't smart enough to own my own business. I had a lot of limiting beliefs. I had a belief that because I didn't have a business education I could be a coach, I couldn't start my own business. I had a belief that I wasn't good looking enough or intelligent enough or funny enough to be in a relationship. I had all these screwed up weird beliefs and tell me if you guys can relate to having some of these on some level or know anyone who's got these beliefs 'cause the first step is acknowledgement and I've said there's no shame in, there's no shame in any of this process of improving ourselves. All of us, every single on of us as a human being, we will have limitations. We will have limiting beliefs and that's just the nature of when we grow up, we get infused with different concepts, with different beliefs from different perspectives. Some of them are empowering and some of them are not. Now that's the distinction we need to discover is well which of the beliefs I've got are empowering and which are not? And that in itself, that will uncover most of the limitations that you've got in your life just based on listening what your beliefs are. And it gets so much deeper. I'll give you another example of a little bit more of a covert element of resistance or limitation. If you don't know what your purpose is. Now if you don't know what your purpose is I encourage you to go back and watch last weeks episode. But if you don't know what your purpose is well that's a limitation. If you don't have the awareness of what you're here to be, do, have and experience and give to the world, well you're limited. You're limited in your awareness of what you're here to do. If you don't know what the vision is for yourself, that's limitation. If you don't know who you're striving to be, if you have no awareness of your true desires, that's a limitation. Lack of awareness is a limitation. We've also got a whole lot of other limitations like skill, knowledge and experience. As we all know, skill, knowledge and experience are things that we accumulate over time. So, the pursuits, the learning, the education, the growth curriculum that you develop for yourself is a period of time that needs to unfold to get to a level of skill, knowledge and experience. And you have to invest that time in self, well in, like a long time, like a fair way back to finally get to that point where you know, okay great. I'm now invested in my skill, knowledge and experience, now I have the ability to create certain results. So, if you haven't invested in the past in your skill, knowledge or experience in learning, then you're going to be limited as a result of the choices that you made in the past. Now there's no point judging yourself or diminishing yourself, however, I think it's really empowering to acknowledge and actually acknowledge the truth that yes there are consequences for the choices that we make. Every choice that we make in life there are consequences. Now you don't have to judge the choices. You can learn from the choices without the judgement . You can look back at your life and not necessarily beat yourself up. In fact I don't recommend beating yourself up. I recommend looking back at your life to look at where were you out of alignment? Where were there some choices that maybe weren't in the best interest of you? Not judging them or diminishing yourself or beating yourself up but learning from it and then saying well if I was going to do it differently, how would I do it differently? So, these are just some classic examples of where we are limited. So again, there is limitation through our whole entire perception as a conscious being. There is, we as a human being there is an inherent limitation that is just part of this game that we're experiencing as a human. And I believe that one of the big parts of this game and one of the fun parts of this game is overcoming and breaking through the limitations. It's like a, it's a game. So start to play the game with lightness and with enjoyment. Good to have you here Fiona, thank you. So, when you approach this whole game with a sense of lightness, it just makes it so much more fun. So, play the game. Yes we've got limitations. Great. Let's spot the limitation and I encourage you guys all for this whole next week to approach your week with a sense of right, my whole awareness exercise for this whole next week is simply to be on the lookout for my limitations. Where am I limited? And as I've said, like I've given ya some examples there around some of the things that we are missing which are limited and you want to go on the hunt. You want to go on the lookout to go where am I limited? Now next time maybe you're having a conversation with someone and you want to, you feel like actually sharing something authentically with them. But there's a bit of fear that kicks in, your ego kicks in, it starts to do its job and it says no we can't share that truth with that person. We might hurt their feelings. Right? So now what happens is you're limited in your expression because of fear and as a result you don't share your truth. That's a limitation. Classic limitation. Now that manifests itself in a whole lot of other different things such as people pleasing. People pleasing is a classic one. People pleasing is the, I'll explain this 'cause this may be you and you might not have even known it. I used to be a people pleaser for a very long time and I didn't even know it. I thought that me putting myself out for the, to make someone else feel good, I thought that was doing a loving kind thing. But look a little deeper. It's a limitation when you don't honour yourself, you're not truly authentic and you're actually expressing or doing something for someone else because you don't want them to judge you or you want them to like you. You want to be liked by someone, which again is a pattern of external validation of self. So, we need to very very cautious and on the lookout for all these covert patterns. Like people pleasing is a classic one because it's disguised as love. It's disguised as generosity. It's disguised as ah, I'm just going to do good for the world. However, if it's at the expense of your authentic expression, if it's at the expense of the reason why you're doing it, if it's because you want validation or if you want to get some kind of, some sort of sense of validation that you were good enough or worthy enough or liked by other people, then that's the ego. That's actually the ego needing validation. 'Cause think about it. Your true self, you don't need validation from anyone. You don't need to hear anything from anyone. If you're truly connected to your true self, your authentic self, we're all good. We don't need the validation. We know that we're enough. We know the truth which is that we are enough, we always have been enough and that we are worthy, we are worthy of love and we don't need anyone else to provide validation of that. That's just the truth. That's just the decision we need to make. So, we need to recognise that if we do want to contribute, we do want to help someone, and I strongly recommend that this is actually a loving thing is if you do want to help someone, you do it from a place of authentic expression. You do it because you want to do it, not because they're going to say something good about you or because if you don't do it you'll feel guilty or external, external, external, external reason. You do it because you want to do it because it brings you joy, because you resonate with it. That's the reason why you want to do something. Not because oh if I don't do it they're going to judge me or if I do that then they're going to like me. That's people pleasing and that is its ego, it's your ego in a very covert operating out of fear. Fear which is the resistance that's getting created. The fear of not being enough. The fear of I need someone to say something nice about me. I need someone to smile at me for me to feel good. If they smile at me then I'll smile. This is the ego very cunningly doing its covert job based out of fear. So that's a key one to be aware of. Another one to be aware of is the opposite, is the flip side of that which is more narcissism. Now narcissism is also a limitation. Judging other people, being self righteous, putting self above others, I'm better than you, I'm a better, now when I say better, saying that we're a better human being than someone else. Now people pleasing is actually kind of saying we're not as good as someone else and that we're to a degree we're kind of worshipping them and hoping that they can give us some validation so they can boost us up. Well narcissism, that's the opposite. That's where we're now judging and diminishing someone else saying they're inferior, you're no good, I'm better than you. Now that's your ego also doing its job. Again, now this one also might be a little bit more covert. It might be a little bit unconscious but that's still operating and it's still the ego doing its job. So it doesn't matter whether you're a narcissist or, and this is context dependent. You might be narcissistic in certain contexts, you might be people pleasing in certain contexts. You need to understand well what are you doing in that moment. Are you judging yourself and diminishing yourself, or are you judging yourself and diminishing someone else? Both is the pattern of the ego. It's the ego doing its job very cleverly and very cunningly. So this is why you've got to be very very careful to really piece through this in a lot of detail to find out the little nuances and the covert judgement and fear that is taking place. Now I've been studying this for a long time now and I can tell you, as your awareness of the ego increases week by week, it's like artificial intelligence. As your consciousness rises, the cleverness of your ego also rises. It keeps up with you. So, the journey of self expansion, of becoming the greatest most authentic version of you, it's a lifelong pursuit. It's an infinitely deepening journey which requires volition, it requires discipline, it requires determination and compassion for self knowing that we've got the ultimate opponent here which is the who which is the limitation. And there will always be limitation present. There is no avoiding limitation. The whole purpose of this experience, this human experience is to experience limitation. So for the purpose of growth, for expansion, for a contrasting experience where this magical life can take place. So, we've also got to stop caring about what other people thing of us. So this is another limitation. People care way too much about what other people think of them. Way too much. If you care about what, now when I say care, what I mean is if you're buying in to the judgement of what someone else is thinking about you that's caring about, you're caring about what they think of you. You don't want to care about what anyone thinks of you. You want to maybe evaluate if someone has some valid accurate feedback around your skill, your knowledge or experience. I think that's valid to observe feedback. However, to care about what someone thinks about you to then make that mean something about your worthiness, or how you feel about yourself or affect your self esteem, that's again that's your ego doing its job which is outsourcing your validation of self and relying on external information to validate who and what you are. That's a limitation. Massive limitation. So, if you stopped caring about what other people thought of you, what do you think your life would be like? How much more self expressed do you think you'd be? Ask yourself that question. If you had no fear, how would you be operating? How much more self expressed would you be? And one of the simple exercises that I started doing when I first started getting into this was the comfort zone challenges and I've talked about these before but these are really powerful. And so this is where we're taking what we talked about and making it practical. You want to now take your fears and your resistance and your limitation and you now want to put it on your agenda to follow through. To create a hit list of everything you want to churn through. So for example, I used to and I used to do this when I was a lot younger before I got into personal development, but I used to be afraid of approaching women. I used to be afraid of talking to girls. So what I did was I set myself a task of right, I'm just going to count down five, four, three, two, one, I'm going to go and approach the first girl that I see and just go and talk to her. I did that for a period of time and I eventually conquered the fear. But let's take a look. I mean that's the practical application of that, but let's take a look at what was actually going on. I was outsourcing my worthiness to whether or not someone was going to approve of me, whether someone was going to like me, so people pleasing, outsourcing my validation of self to others, low self worth, low self love, completely externalising my experience of life and completely outsourcing my sovereignty and my self worth to some experience of interacting with some person that I don't even know. So it's crazy right? So we've got to unpack lots of these little scenarios of any element of resistance that we're experiencing, we've got to unpack it, pull it apart, completely dissect it, rip it apart and see all the little elements that are coming together to create the illusion of fear. So, I'll give you another example. Procrastination. Procrastination, and there's a lot of different causes of procrastination but procrastination is another major limitation. It's a limitation because if you're procrastinating, you're not taking action. You're not driving your life forward. You have no motivation. You're missing something. So, if we're observing procrastination, that's a fundamental limitation. Now we've got to get to the bottom of what's causing it. Now it might be that you're disconnected with your purpose. It might be that you're overwhelmed. It might be that you don't know what to do. It might be you don't know what sequence to do things in. It might be that you're looking at too much and it's causing a sense of overwhelm. Or it could be that you're afraid. And I suspect this is typically the most common pattern for procrastination which is fear of failing, fear of the judgement of others, fear if we put something out. I used to be in fear of doing these Facebook Lives. I used to be afraid of doing these live broadcasts and the fear was what if I get it wrong? What if I'm not perfect? So perfectionism. What if someone judges me? What if someone says something about me? What if it doesn't go right? What if I slur my words? What if, what if, what if, what if? It's the mind and the ego based out of fear doing its job. And so we've got to recognise, okay, great. That's what's actually happening. It's not that my problem's procrastination, it's going a level deeper and saying well what's the genesis? What's the source of the procrastination? What's the source of the limitation? And it goes back to the mind. It goes back to the ego. It goes back to what's the reason why we're not in taking inspired action at every single moment in our life? And if we are not moving forward, making intuitive based decisions based on inspired action, there's a limitation there and we've got to go hunting for that. Now as I've said it might be fear, fear of success, fear of rejection, fear of judgement , fear of criticism. Typically it's going to be fear. It's going to be a fear based programme and no surprises, your ego is doing its job once again. So this is why a lot of these principles and concepts come back to the ego. We're going to understand this software programme that we've been loaded on with, and once we get to the bottom of it, we can start to crack the code on a lot of these little nuances, a lot of these little limitations. Once we understand them, so the first step is awareness, the next step is understanding, the next level is we've now got to take action which is creating a structure, creating a hit list to take action which is to implement. That then allows us to embody the change. So, I want to give you some examples of some of the actions that you can take to overcome some of these limitations. So, first of all is awareness. So, if you do experience procrastination and let me know if any of you guys have experienced procrastination, or are currently experiencing it in some context and we'll all experience it in different contexts. Some of us are procrastinating in a business. Some of us are procrastinating in a context of a relationship or exercise of health. Procrastination is simply not taking action. It's stalling. It's some form of resistance present within us. So, and you know if you're not taking inspired action there's limitation there. There's some unconscious element of resistance preventing you from moving forward and you've got to get to the bottom of it. You can't just say oh my problems procrastinating. You got to get more specific. You got to chunk down on the problem. When you chunk down the problem you'll notice that's where the, the devil's in the detail. All the information you'll ever need to know is in every problem you've got when you chunk down to specific enough level that you understand ah that's why I'm procrastinating. I'm procrastinating because I'm afraid of what someone else is going to think of me. Interesting. What I'm there doing is I'm outsourcing mt validation of self to them, which means that my worthiness is probably pretty low because I'm now relying on someone else to validate me and my worthiness which is now affecting my ability to love myself. So wow, this is not just, this is not actually procrastination. This is me having a lack of worthiness and a lack of the ability to stand in my authority and own my life and make a decision to go move forward. Wow. Procrastination has just changed. It's completely changed. It's not this, oh it's just procrastination. It's hm, actually I have low worthiness or I am outsourcing my self esteem to the opinion of someone else. I'm glad that I now know that 'cause it's not procrastination. So, I hope what I've helped you come to the awareness of is really that the problem is never the problem. We need to chunk so specifically down on the problem. When you get to that level of detail, it becomes simple. It becomes you now have a task list, you have a hit list of things to work on. So, as I said the first step is awareness. So I would recommend that you keep a list of all your limitations. Now, you might say oh great Chris. Oh, I don't want to keep a list of all my limitations. I don't, I, it sounds quite depressing. Well, by being aware of your limitations and documenting them on a daily basis, you have something to work with. You're now taking the unconscious and you're making it conscious. You are now empowered to understand what are the restrictions, what are the limitations in your life? What you are now aware of you can now move beyond 'cause if you're not aware of it, well bad luck. You can't do anything about it. Yeah. Good to hear you're back on track Dora. So, awareness is the first step. So have your hit list. Now what I also recommend you do to keep this really practical, this is now one of the apply notes that you're writing, is during your day I recommend you have a diary next to you. I recommend you have a couple of diaries and I'll talk about that a bit later but the first diary is your daily planner which is how you schedule everything in your day which should be with very accurate precise tasks, deadlines, responsibilities, accountabilities. Now that's a whole nother issue. But then my point is on the other diary you actually want to record, and I call this my misalignment journal. So in your misalignment journal, which is a whole other separate diary which is part of your journal. I recommend you get one of these like this and you keep it around you all day everyday, or also put your notes in Evernote for those of you that haven't got Evernote or some sort of note keeping software on your phone, keep that with you as well because you can pull all these limitations in. When you capture them, when you become aware of them that's empowerment, that's true power. So you want to capture all of your misalignment. So for example, what is misalignment? Well, you might have an experience where maybe a co-worker, there might be a conflict with a co-worker and you wanted to share your truth. You wanted to share what actually happened but you felt oh, no. I'm scared, I'm afraid. My ego now is doing its job. And now we might just back away. We might get afraid, we might think oh it's not worth it and then five minutes later or an hour you think aw I should've said that. I should've actually expressed myself. You guys have ever experienced that? Where it's like ah, I wanted to express that but I didn't? Well, that was a limitation. That was your ego doing its job. Hey Carrie, good to see you here. That was your ego doing its thing. So now, you pull out your misalignment journal. And what you do is you now document. Okay. At 3 p.m. I had an argument with, I had an altercation with a colleague and I didn't express myself. What just happened there? Well my ego was doing its job, I was afraid, I was afraid I didn't express myself, I was worried that they were going to judge me, I was afraid of this, this, this and this. So all of a sudden now, that experience, you can unpack it. You've now got the power to transform that experience so it doesn't happen again. So now in your misalignment journal what you'll do is you'll reflect on that. I recommend you reflect on it every evening. As a minimum every week you reflect on it and you've now got a hit list for knowing where you're out of alignment. You now know ah, I'm not expressing my truth here. Oh, I'm procrastinating here. Oh, I woke up tired this morning or I didn't hit the gym today and I promised myself I'd hit the gym. So, you're now keeping track of all the misalignment. Now that you're aware of the misalignment you can do something about it. Most people, like on average we have 35,000 choices per day. That's what the psychologists have discovered. That's the number of choices we have per day. Now how many of those choices do you think were conscious? And then how many of those choices do you think were in true alignment with your true self? Now if you could just capture 1% of those or 2% of those choices that you made that were out of alignment, there's so much valuable data in that experience. So really really powerful experience to go through and capture the misalignment. So, I highly recommend keeping a misalignment journal. It's going to be absolute gold. It helps you completely master the ego. It helps you master self completely because you start to understand all these little limitations. So this is where you're documenting your limitations through the course of the day. So you want to start asking some questions that are also going to elicit some of these other limitations. Things like where are you playing small? Where are you playing small? Right? Now again if we're playing small what's going on? Is it, now again I want to create the distinction here. Sometimes we don't have to play big. Sometimes big is not necessarily authentic. You don't have to create the biggest business in the world. You don't have to save thousands of people's lives. You need you need steady to do what's authentic to you and when I say play big I mean honour your authenticity. Honour what you're truly here to experience. So, play big in the sense of express and create what you are here to do. So, play big, play great, play authentic and if there's any limitation in your authentic expression, chalk it up on the misalignment journal. That's right. Today I wanted to release a Facebook video for example but I procrastinated because I was afraid. Right, that one goes down. So now we start to unpack these in a greater level of detail and as I said the devil is in the detail. You've got to condense all of these down. When you get it to such a level of detail, you can do something with it. You can put it on your agenda and your hit list. 'Cause you've got to start asking well why is the fear even present? Why is the limitation present? How did it get there? What's the belief system that's behind it that's driving the fear? What's the perspective that you're seeing your reality through such that limitation isn't even present in the first place? And I think a great benchmark to have would be 100% limitless unrestricted self expression is all day everyday you're coming from a place of connection, alignment and inspired action. Now that would be true limitlessness. Now if we are not experiencing that there is a limitation. If we're not experiencing clarity, motivation, inspiration, drive, determination, clarity in the purpose, the vision, the mission, the values. If we don't have clarity at all moments we know there is a limitation. And I think there's honour in just acknowledging that yes there are limitations. And this whole purpose of this broadcast is to actually acknowledge and honour yes, these are limitations. We're human. We have limitation but to deny these limitations are here, to pretend that we don't have them, to not take responsibility for acknowledging them, that for me is a life of mediocrity. That's to not honour our authentic spark. That's not to honour our true self. We have greatness that we are here to express. And for us to just get to the end of the day and not reflect on the misalignment or not reflect on what were the limitations of that experience, we're letting so much valuable data and gifts of knowledge and experience and wisdom pass us by. So every single day you want to capture that, as much of that experience as you can and learn from it. Learn from it. That's what it's about. It's not about beating yourself up and looking at the darkness for the sake of just drumming up something to deal with. It's actually looking at our life from the point of being accountable to ourselves, being accountable to our dreams, being responsible to what we're truly here to experience, valuing our life so much that we are diligent, we are structured, we are determined about how we approach our personal growth and if we truly care about the people in our lives as well as ourself then I think it's our duty to actually look at the misalignment. To look at the limitation and say right, great. I'm aware of this limitation. Now that I'm aware of it I can understand it. Now that I can understand it I can take action on it. Now I can embody a new way of being. So that the journey. Awareness, understanding, action, embodiment. And you've got to go through each of those steps. Have to go through those steps. Otherwise the limitation is going to stay there. So, most of this broadcast has been focused on creating awareness of limitation, but I just want to give you a couple of other insights of the other things that you can do that are going to add to the structure of overcoming these limitations. So definitely at the end of each day keep a journal. If you want to go through and review the journal entries. Now what you also want to do is you want to then ask yourself if you could do that experience over again, and I think this is one of the best questions you can ask at the end of your day, is if I could do today all over again, if I could do it better why would have done it better? That's a limitation. If we could've done something better, then we were limited. Boom, that just opens up a whole nother can of worms. Right? So any area we can improve, any 1% improvement, there must have been a limitation. Now there is always going to be a limitation 'til the end of our life. That's just the way that life is. However, I trust you get that when we're playful around this, when we celebrate the limitation, when we acknowledge hey, I'm not perfect. I'm not perfect, I'm far from perfect. There's plenty of mistakes that I make on a daily basis and you know what? I'm starting to have compassion for self and recognise you know what? I'm going to make mistakes and I'm okay with it. I'm not perfect, I have limitations and you know what? I'm going to keep taking action anyway. So I recommend that that's the best approach is feel the fear and do it anyway and the more advanced approach is well, if you're feeling the feel understand why you're experiencing the fear and then unpack the awareness, the understanding and the action to overwrite the fear. So, fear is a key programme. It's part of the ego and it's always going to be with us so we need to master this programme. We need to have awareness of it. We need to have, we need to find awareness of all these programmes and patterns to move beyond them because if we're not aware of them we can't change them. So, that's most of the goal that I wanted to share with you tonight around becoming aware of limitations and some of the structure around what to then do about it. And as I said the devil is in the detail. When you take a look at it you can unpack it. You've got to focus, you've got to prioritise your limitations, you've got to look at your fears, your limiting beliefs, you got to look at any element when you experience some form of resistance. If you're not motivated, inspired in taking inspired action at all moments then there's some degree of limitation there. Now it's not judging their limitations. Certainly, I'm glad it's resonating Sharmain. Thank you. If it's limiting you in some way, then if you're, you just got to acknowledge it and you've got to celebrate it. So, I trust that's been useful. I trust you now understand and have awareness of how important it is to document your limitations on a daily, I'm doing mine on a daily basis. Daily basis. And if you can take all the data or all the wisdom, all the knowledge, all the learnings and all the misalignment every single day, now admittedly you might not get every single one of those 35,000 choices per day, but if you get even 1% of those misaligned choices, you can course correct because you now have the data. You now have a plan. You now have awareness. You've got, it's like a report card. You know what subjects you need to work on. So, please treat this, I don't want to use the word seriousness because I think it's too serious. Treat it with a diligence and treat it with the care that it deserves because this is your life. It's so incredibly important that if you want to live your most authentic greatest life, you've got to overcome your limitations. So, I trust this has been valuable. Thanks Katrina. Thanks for tuning in and yeah, get to work on documenting, becoming aware, starting to understand, starting to take action on and then embody the new changes to move beyond and break through your limitations. Thank you guys so much for tuning in. Thanks Dora. As always lots of love and please tune in again next week same time again next Tuesday for some more life transforming tips, hacks, tools of consciousness and how to improve your life and live your best life ever. Thanks for tuning in guys. Have a great week and bye for now. Much love. See ya.